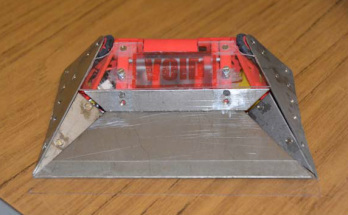 As this version of Void had done so well, winning an AWS on its first outing, I didn't want to change much. The only major thing I wanted to sort out was the slow speed, and decided that the only way to get around that issue was to work out a way of making the tracks differently so that the motors did not draw so much current, allowing me to run on the 3 cells I had originally intended. I once again tried different materials in order to make new tracks, as well as prototyped a couple of different systems which would fit within the current chassis, but nothing was an improvement. It occurred to me that it was the sections of track which were being bent around the pulleys that had the most tension on them, and so if I could make the material bend more easily, it would alleviate this. I achieved this by building a small rig for my dremel which allowed me to go around the length of the track, cutting 1mm deep slots into the material at regular intervals. The sections where I had removed some material bent a lot easier, allowing the entire track to twist and stretch much more than before - so much so, in fact, that I had to shorten the overall track length to keep the tension at a reasonable level. However, the modification was a success, and the motors were drawing significantly less current, which allowed me to upgrade to the 3-cell pack I had originally wanted. This also meant I needed to install a 9v regulator to run the servo from. Because of the modifications I'd made to the drive, this version started off really well, however it quickly became apparent that the performance was worsening quickly. It seemed that with the extra speed on the motors, the surface of the pulleys was being worn smooth, and they were having trouble gripping the track in order to move them. The only way I could rectify this was for running the tracks for 30 seconds or so before each fight to warm the rubber up, which allowed the pulleys to get a better purchase. I managed to keep everything running until the end of AWS42, where I managed to take the trophy again with a very tired machine. I once again feel I got very lucky - I had very limited mobility in the later rounds, and think it was just the overall shape of Void, and it's powerful flipper, which allowed me to turn the odds in my favor. While these tracks have been a very fun experiment, I'm going to be returning to reliable wheels in the next version. While I think tracks can be excellent when done correctly, I don't think there's a way to do them in this Void's body shape that would be free of the issues I encountered, and I'd rather opt for the more reliable option. That said, I was very happy with the overall shape and design of this version, as well as the geometry I used on the flipper, which was flipping robots excellently. I'll be keeping these aspects moving into version 9, but removing the grabbing functionality (which never worked) and using a more reliable and efficient drive system.